Bikes, Blues & BBQ is The Big Daddy of Motorcycle Rallies with something for everyone but what it all comes down to is “the ride”. The winding mountain roads of the Ozarks are perfect for riding. 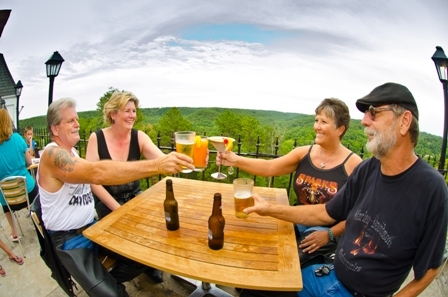 Stop by BBB but don’t miss out on one of the most scenic parts of Northwest Arkansas…Eureka Springs. It’s worth an extra day to explore the historic little mountain town. Eurekan’s love motorcycles. In fact, the Mayor of Eureka Springs regularly rides around town on his hog. Don’t miss all of the great things happening in Eureka Springs in September. Antique car show, Jazz Weekend, Eurekapalooza, the Motorcycle Art Show and more. See the Official Eureka Springs Calendar of Events for details. While you are in town be sure to stop for a drink with a view on top of Crescent Mountain in the Sky Bar of the Crescent Hotel. When you are downtown discover “Eureka’s Best Burger” and enjoy drinks at the copper bar of The Balcony or shoot some pool in Lucky 7 Billards inside the Basin Park Hotel. Stay over a day or two in Eureka Springs. Get last minute deals and overnight specials. Consider riding the Eureka Springs option in the BBB Poker Run. There is free music on Dickson but Lynyrd Skynyrd is performing in the Arkansas Music Pavilion September 12th. Get your tickets online now! This entry was posted on August 29, 2013 by estcblog in Basin Park Hotel, Crescent Hotel, Festivals, Fun Downtown, Motorcycle Friendly Lodging, Road trips and tagged Arkansas, Balcony, Eureka Springs, Eureka Springs Arkansas, Fayetteville Arkansas, Fayetteville–Springdale–Rogers Metropolitan Area, Lynyrd Skynyrd, Ozarks.